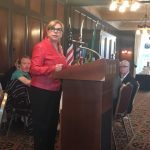 Siem Lelum Harbourside Rotary presentation | Linda E. Ross Property Management Inc. Imagine downtown Victoria. See the twinkling lights of the Legislature, smell the sea, and feel the breeze on your face. Now imagine the land a couple of hundred years ago, canoes in the harbour, villages along the shore, and Big Houses dotting the landscape with Arbutus trees swaying in the background. We visited this land on early Wednesday morning, where we were honoured to attend a breakfast meeting at the Harbourside Rotary Club as a guest speaker. We spoke about Aboriginal issues in Victoria and across Canada, particularly issues grounded in housing. Housing remains an issue for Aboriginal families across the Nation. Many families are unable to find housing on reserve, as housing is in short supply. Housing shortages, particularly in urban centers, can lead to homelessness, overcrowding and possible eviction due to overcrowding. Traditionally Big Houses were used by the Coast Salish people. Big Houses are large community dwellings, where daily activities like child care and cooking would take place. The Big House also acted as a stage for ritual dances, dramas during mid-winter festivals and potlatches. However, modern housing solutions rarely address the sense of community achieved through a Big House. At Siem Lelum, we will create a community center where our tenants can practice a more Traditional way of life. Siem Lelum is designed to be a safe space for young families, youth and grandparents raising their grandchildren. We are fundraising for a community center and kinetic playground to embrace the notion of an “Urban Village”. The community center will be used as a classroom, gathering area, and kitchen for the residents and the kinetic playground will encourage residents of Siem Lelum to maintain a healthy lifestyle for their children and themselves. Through Siem Lelum, we hope to empower Aboriginal people on their traditional lands to regain their health and restore their pride of belonging in the community. 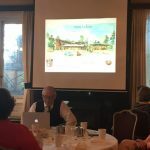 While at the Rotary Club we asked the members to help us promote and support phase two of Siem Lelum which will include the Community Room and Kinetic Playground. Siem Lelum will be a community focused, environmentally respectful, affordable and culturally active urban village of learning, laughter and play. Aboriginal Tenants will have an onsite full-time Tenant Support Worker, and participate in the renewal of traditional community practices. Donations from the public can be made at the Victoria Native Friendship Center website or by visiting the Siem Lelum Facebook page and selecting “Donate Now”.